Remember, this is what the kitchen looks like now. Also, Eleanor helped assemble some flat-packed Swedish furniture for my office. So handy, that little girl is! Painting Walls with Picture Rail? Your kitchen is beautiful already! Can’t wait to see what it looks like after you redo it all. If that’s the before, I eagerly await the after! What’s that green swatch? And are you keeping the curtains? oh, i’ve been a fan of that paint color for quite some time. can’t wait to see what it looks like for totally selfish reasons. I can’t wait to see how it looks with painted trim. We have stained trim as well and I can’t decide if I should paint it or not! No gasps here. Unpainted trim is not sacred to me. Bring on the paint! full support for you painting the trim. painted trim is not a crime. I third a thumbs up for painted trim. I’ve never been a fan of dark wood trim so I can’t wait to see the newly painted kitchen. you may come and paint over here anytime you have the urge and no available walls to paint at your home, just sayin’. A fresh coat of paint is always so exciting and new!! Its about time Eleanor starts earning her keep! (: Can’t wait to see the finished kitchen!! I can’t wait to see what this looks like! I can’t wait to see! Way to go on painting the trim! I’ve always loved those knobs. Can’t wait to see the re-do! Oooo, love the colour! Can’t wait to see the kitchen freshly painted! We painted our kitchen in Swiss Coffee a few months ago (it was big bird yellow when we moved in) and we love it. Can’t wait to see the pix. I think that’s just beautiful. I can’t wait to see the finished product! Playing the grinch here…..paint fumes are highly toxic for grownups let alone little lungs. Be sure to keep the area really well ventilated (for several days) and keep little Eleanor away. Might be a good time to go to grandma’s. Paint can cause headaches and nausea, sometimes leading to asthma. Even the more environmentally friendly ones have issues. As the paint chip looks like it is Behr you really might want to check the first link. Just saying. Love the color choices and I bet it will look amazing. However, painting the trim makes me sad! I have half unpainted, half painted in my house and wish it was all unpainted. Either way can’t wait to see the reveal. Excited to see the changes! I have a question: what are your countertops made of? I’m about to switch mine out and am having trouble finding ones I like, but I like yours! I’m all for painting the trim- dark wood trim, lovely yes, but it can weigh a home down when it’s in every room. 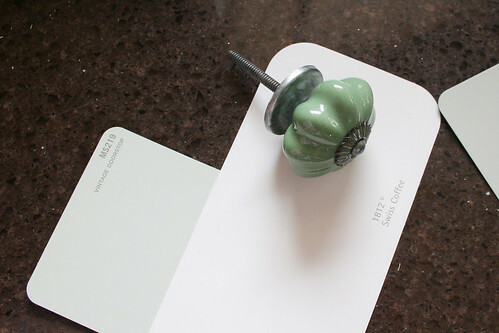 I’ve just decided to paint all the trim in my condo…I’m excited to see how yours turns out! aww!!! Eleanor will be as good as you are at fixing stuff!!!! too cute… Can’t wait to see the new looks of your kitchen! I’m sad you are painting the trim! One of the things I love about your house pics is all the gorgeous unpainted trim. I’m bored with all white trim in every furniture store catalog pic and apartmenttherapy.com post–your house is a nice contrast to all that, especially since the wood appears in good condition. Looking forward to seeing how it looks! I like the creamy yellow colour that you’ve got it now – it’s something that I want for my own place – but I think the colours you’ve chosen are really lovely as well! Oh, this is gonna be good, I can feel it! Good job, Eleanor! Way to help out. Awww, Eleanor looks so cute! Love the colors! Can’t wait to see the after! Ooooooh, (I know, I know, I am actually squealing — sorry!) I cannot wait to see the trim painted! We painted all of our 30-year-old dark trim white as soon as we moved in and I have never regretted it. Never ever ever! It looks so crisp and clean now. I think painting dark wood white is one of the most gratifying feelings in the world. Just finished painting every last bit of trim in our (over a century old with amazing wood detailing) home a bright, clean white and I couldn’t be happier. The only thing more classic than natural wood — a nice crisp white. You’re going to love it! Ohhh, love the kitchen cabinets and counter! I think it will be sooo lovely with painted trim. I’m a fan of light and bright, crisp and clean and have always found dark / natural wood trim depressing. lol..I know that probably made some people groan, but to each his own, right? Enjoy the “new” kitchen. I can’t wait to see what it looks like. 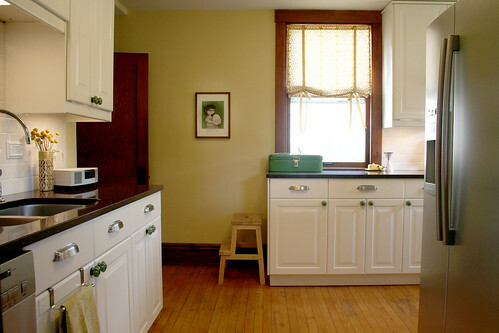 We have similar woodwork in our entire house, and although it’s in really great shape and we don’t want to paint it in most of the house, I wonder if painting it in only the kitchen would freshen things up. Can’t wait to see what you do! I can’t wait to see it! Is that green you are painting? My fave color! 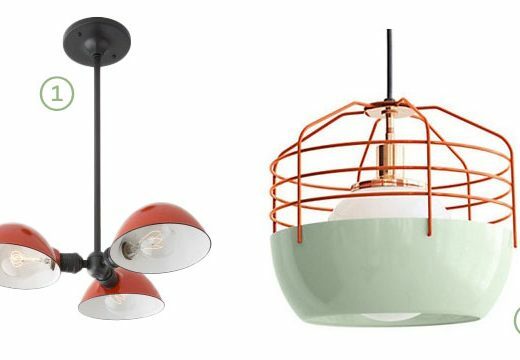 And it’ll look great in your vintagy kitchen. I’m not anti trim painting at all, so go for it! I love those green knobs, are they from Anthropologie? The trim in our house is swiss coffee too! It’s the perfect shade, not too stark white and not too off white. I’m a fan of painting wood trim too. It really makes a difference in brightening the space up! Ooooh… Painting the trim! I am shocked and saddened at your sudden deviance… Just kidding. I am shocked though.